Three firefighters have been killed and four others have been injured battling a wildfire in Washington state on Wednesday, the governor's office announced. In a statement, Washington Governor Jay Inslee said his heart "breaks over the loss of life." "I know all Washington joins me and Trudi in sending our prayers to the families of these brave firefighters," he added. "They gave their lives to protect others. It was their calling, but the loss for their families is immense and I know the community will come together to support them." The firefighters were battling a fire near Twisp when changing winds trapped them in the fire, according to the Seattle Times. One of the injured firefighters is in critical condition, King 5 News reported. The fire is occuring near the town of Twisp, located in northwest Washington about 180 miles from Seattle. So far, the flames have burned through 50 acres and are threatening about 20 buildings, the Department of Natural Resources told KREM News. Evacuation orders have been issued for Twisp and neighboring Winthrop. The orders affect roughly 3,000 people, the Seattle Times reported. "All residents should evacuate in the direction of Pateros or Omak immediately. Be aware of your surroundings, notify neighbors who may not have communications, and leave carefully," the Okanogan County Emergency Management wrote on its Facebook page Wednesday. Inslee said conditions in the affected area of Washington are still "extremely dangerous" and urged residents to obey evacuation orders. 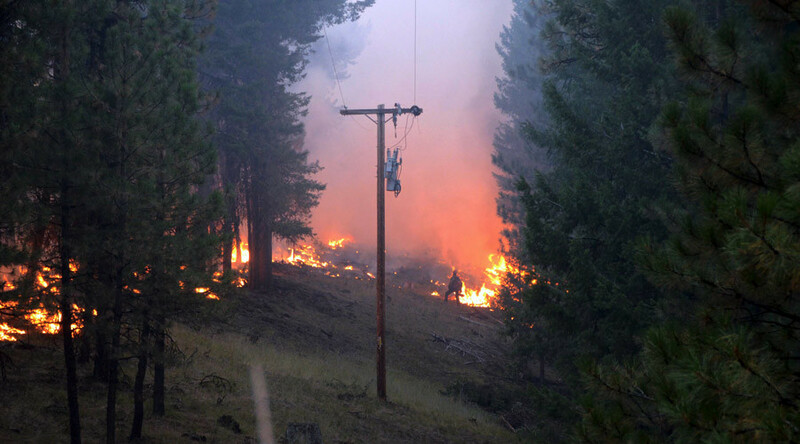 The fire near Twisp is just one of at least five raging in Okanogan County. The group of fires have altogether doubled in size since Tuesday and ripped through more than 37,000 acres of land by Wednesday morning. On Tuesday, 200 people in the town of Conconully, also in the same county, were evacuated over the threat posed by wildfires. Roughly 4,000 homes in the region have been evacuated, Angela Seydel of the county emergency department told the Associated Press.